This recent statement made by The Leader of the Indigenous People of Biafra (IPOB) Nnamdi Kanu reads; In a society as apathetic as Nigeria, very rare breed of people can boldly stand to challenge the injustice of a judicial system frightened into obeying the dictates of a brutal dictator against every tenet and norm of democratic governance and the rule of law. “What he and other activists have done today by their actions goes to show that if many people stand up for the truth together at the same time, there won’t be any space in Africa for tyranny and repressive regimes like the one people are forced to endure under this intellectually and morally bankrupt regime in Nigeria. “The concerted fight against the rights of individuals, the endless humiliation of those unfortunate to find themselves in Nigeria by the security agencies especially the police and DSS under the watch of this present tyrannical All Progressives Congress, APC, government, coupled with docile and easily manipulable judiciary must be brought to an end. “For injustice to end the entire population must rise up as one to reject it as Deji Adeyanju has tried to do. 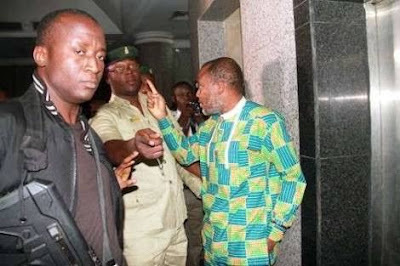 ‘’ Nnamdi Kanu declared to stop the tyrannical government of the President Muhammadu Buhari-led All Progressives Congress (APC) The Radio Biafra Director who is in Kuje prison, Abuja, through his spokesperson, Emma Powerful said there is no more space for tyranny and repressive government in Nigeria and Africa. He insisted that the alleged repressive and tyrannical government in Nigeria will fissile out in no distant time. Kanu made the claim while reacting to the protest march in his honor by organized by Prince Deji Adeyanju. He commended Adeyanju for his exceptional bravery and courage in the face tyrannical intimidation.